A 60th birthday is definitely something to celebrate so grab these "60" Glittered Boppers and show it off to all of your friends, family and coworkers. 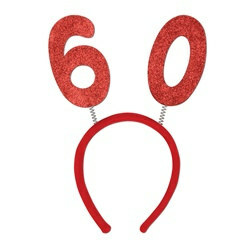 These "60" Glittered Boppers are great for wearing for your own birthday or giving to a friend to help celebrate his or her birthday as well. This inexpensive party supply is attached to a fabric covered headband making them easy and comfortable to wear. This is really a cute headband. Fun item.